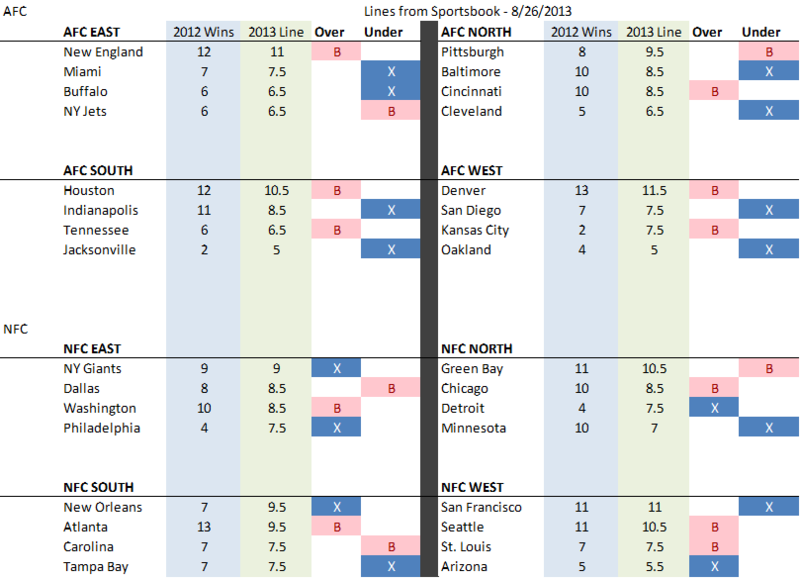 As is our custom for the start of football season, my colleague BPix and I switched from playoff-picking in the MLB to overs/unders for the NFL. I see playoff picking in the NFL as more of a toss-up due to the outsized impact that injury can have and the general parity across the NFL. You could argue that the Broncos (before the dismantling of Baltimore and NY) could drop a lot of the early games without Von and Champ, ultimately losing the division to the Chiefs (2-14 in 2012). I think the overs/unders set by Vegas give us a little more information, and by picking across the entire league, we reduce some of the random injury/TO luck effects. Also in MLB/NBA, we pick mid-season where we have some data; in the NFL, the season is so comparatively short that it doesn't make as much sense. First, the AFC. I did not pick a single over in this conference, which is shocking given I won the NFL portion of our competition by picking overs last year. My view was that each of the AFC teams have major flaws and more than half will under-perform their win projection. Of course they also play each other most weekends, so some teams will win by default, but I figured grabbing the under on as many teams as possible would give me a slight edge. It's like Mike Shanahan's running backs: you don't know who will emerge, but that back will get 1,000 yards, so you take all of them in a fantasy draft (only to forget Alfred Morris, luckily claiming him after my Week 1 walloping last year). Overs I did like: BPix taking the over on the Pats with 5 division wins seemingly guaranteed (before their struggles these last two weeks), and his over on Cincinnati was also smart given they will likely have the best offensive (A.J. Green) and defensive (Geno Atkins) player in most matchups. Injuries (Champ Bailey) and suspensions (Von Miller) scared me from the Denver over, but it's an easy division, the reason the Chiefs over is also a good choice (not to mention a drastic coach/QB makeover). The Houston over is okay for the same reasons, though I really question the Tennessee pick: I don't believe in Jake Locker, I don't think he sees the field well and I don't buy that Chris Johnson can be that guy again. Then again, their defense has been surprisingly good; we'll see if it holds. As for the unders: I think Miami may have been a mistake in the East, though I hated the way the Bills have built their team. These are the positions they sought in their 2013 draft: QB, WR, LB, WR, DB, DB, K, TE. Presumably, they will be kicking a lot as evidenced by their 6th round selection of a kicker. I mean, it's only the 6th round. Guys like Tom Brady (or Matt Birk) certainly don't last that long. The other issue: I like E.J. Manuel and think he was the best QB in the draft: good footwork and mechanics with athleticism. But 8 selections and no linemen? Linemen are what allowed the Pats to keep Brady clean all those years. Defensive linemen are what led the Jets to two straight AFC championships. This draft was a terrible mistake. And to make things worse, Marrone inserts Manuel into the Week 1 starting lineup 3 weeks after Manuel had knee surgery! This reeks of organizational dysfunction: Marrone is already myopically trying to win the next game, sacrificing his players, and it's year 1! Manuel may eventually turn into something, but Doug Marrone will not be the Buffalo coach when he does. Finally, I also liked BPix' under on the Jets: 3 picks in his last preseason game aside, Geno Smith does not have the makeup of a successful starting QB. One of the rules I like for my QBs: does the person have the mental makeup and toughness that if he were to play another position, could contribute to the team. Take Tom Brady: he is such a great competitor, prepares so diligently, and is so smart and focused that if he had the genetic disposition of a lineman, safety, or even special teams player, I think he would find a way to contribute to his team and be a key component to winning. I don't see him as needing the QB hype or thinking of other duties as below him. Of course, he couldn't play O-line, but that's beyond the point. Russell Wilson and Peyton Manning, are other guys in this mold. Tim Tebow is the opposite: he needs to realize that he is not an NFL QB but he can contribute if he swallows his pride and converts to another position. I think Geno Smith fails this test. I think he needs the hype, the attention, and the leadership role that QB is. Other guys in this mold: Josh Freeman, Jay Cutler, Johnny Manziel, and to a degree, RG3. You want your QB to lead, vocalize, and show attitude. But these guys are walking a line where they could lose their teams. I'm not saying that none of these guys will be successful or that their teams/fanbases won't rally behind them. We've seen that with Cutler and Griffin. But both of those guys have flashed skill beyond average (especially Griffin) that, while make them great starters, separate them from the best. In the South, I thought the Colts are an 8-8 team even though the line already adjusts for their luck-filled 2012 (pun intended). And Jacksonville is an abomination. I think Gabbert is actually a functioning backup, but Henne is probably their best QB. And again: after drafting fantastic tackle Luke Joeckel, they went safety, CB, WR, WR, safety, CB, CB. Yeah Gabbert/Henne need somebody to throw too. But in a division where the Texans and Titans want to run, not one lineman after Joeckel is not just a travesty, it's a joke (sorry). I hate what the Ravens had to do by gutting their team for Flacco's contract, but I understand it: he had a ton of leverage. Ozzie will get them back, but not for a few years. I don't believe in Cleveland's running game or QB and think new management is smartly looking forward to next year's start-studded draft. In the West, I think Phillip Rivers is washed up (though he showed up today), and Oakland may be the worst team in the league (I suppose they beat the Jags today). This is another dysfunctional franchise under Mark Davis, and their development will continue to be held back for a few years by the Carson Palmer trade.